Selling families of products can create unique fixture demands. 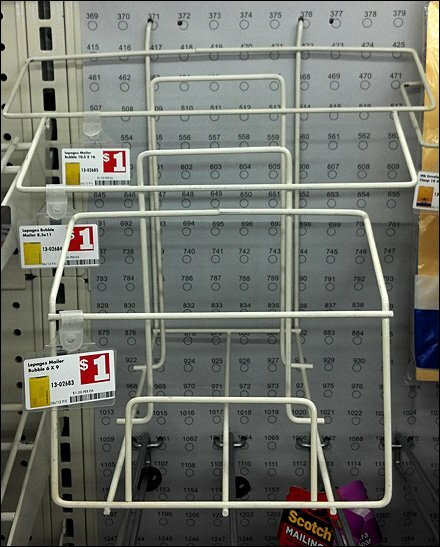 Here a rack is designed to mount on pegboard and display multiple size mailers in a way in which size can be judged against the others. Plus all sizes remain visible, one behind the other. The rack is not square and true, however, implying either age, abuse or poor quality manufacture. Note that Hang or Basket Tags are used for pricing and product identification. Many racks might have included Metal Plate or other label holder mounts as part of the design. Another indicator of cost cutting. 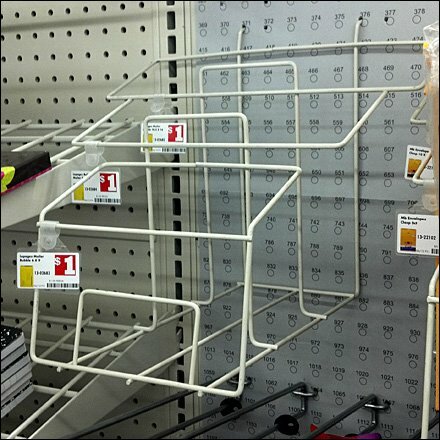 If contemplating such a rack, make sure it will also sit on a shelf in case that use might someday be needed. CLICK the thumbnail for an alternate view.